Sinkholes are a common feature in Florida's limestone-rich bedrock as groundwater easily dissolves the calcium carbonate into solution turning the ground into a slushy mix that washes out under the structures built on top of it. But rarely do they kill. On Thursday night, a sinkhole in Tampa opened up and swallowed the bedroom where Jeffrey Bush, 37, was sleeping. Rescue crews and his brother acted quickly to try and save him, but Friday morning listening devices and cameras placed in the hole failed to pick up any signs of life. Body in Fla. sinkhole "not possible to recover"
The fast-acting sinkhole that likely took Bush in his sleep is unusual. Most sinkholes give warning signs of their impending devastation. Sinkholes form when water dissolves minerals in the bedrock leaving the structures on top of the ground sitting precariously on loose soil that can quickly wash away. If a sinkhole is in the process of forming the structures on top of it can give a hint to its existence: for example, slumping or sagging fence posts, and trees that start to lean. More subtle signs can include doors and windows that don't close properly. 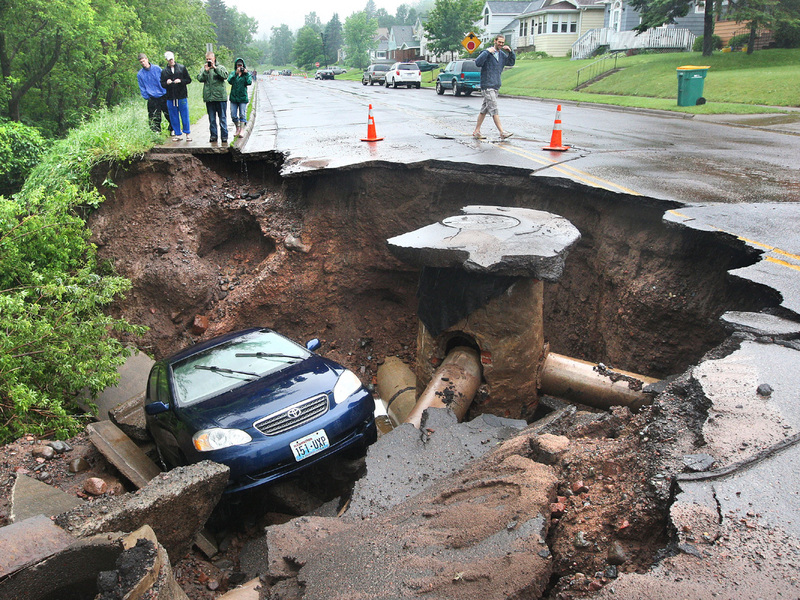 Heavy rains can trigger the collapse of a sinkhole that had been slowly forming earlier. When rainfall collects in an area where water previously did not collect, that is another sign that the land is subsiding. Bad enough that sinkholes could be forming under your feet in normal rains. Bring a hurricane to the region and it could feel like not only the sky is falling, but the ground is falling as well. When tropical storm Agatha blew through Guatemala in 2010, the volcano-pocked nation witnessed the worst kind of sinkhole form in the middle of Guatemala City: a 100-foot deep, 66-foot wide circular chasm called a "piping feature." Unlike most sinkholes where the bedrock is dissolved, the Guatemala City hole formed from water washing away the remnants of ancient volcanic debris, pumice and ash. Much of the city is built on top of this volcanic fill, which reaches depths of 600 feet. If a sinkhole is caught early, cities can inject grout into the hole to rebuild a foundation over the degrading bedrock. "It's similar to a dentist filling a cavity," Anthony Randazzo of Geohazards, Inc., told USAToday. "It sets and hardens and stabilizes it." Sometimes the groundwater dissolving the limestone bedrock flows deep beneath the bedrock. In Mexico, many sinkholes called cenotes expose these underground rivers and show the location of underwater limestone caves. When entering a cenote it is culturally respectful to ask the Mayan Gods for their protection, to keep any more of the ground surface from falling in on top of your head. When the earth falls out from under your feet, it may not be a sinkhole at all, but rather an earthquake. When the Alaskan earthquake struck on March 27, 1964, Fourth Avenue dropped 20 feet below normal level as the result of the shifting fault-line. When sudden seismic shaking occurs near the coast don't wait for a tsunami warning siren, head to higher ground. Blue holes along low-lying coastlines are the remnants of sinkholes formed during past ice ages when sea level was 300 to 400 feet lower than today. As sea level rose, the sinkholes became flooded, forming vertical caves. The deep blue color of the hole contrasts with the lighter white carbonate sands of the surrounding seafloor and the water is home to many varieties of marine species. SCUBA diving in a blue hole can be dangerous as the depth is difficult to judge with just your eyes. Divers must vigilantly check their depth gauges to make sure they don't exceed their safety limits. Exploring the interlinking limestone caves within Northern Madagascar's Ankarana National Park is best done in the dry season. During the wet season, the rivers that flow through the caves and provide the water for some of the lush forests that crop up like oasis on sinkhole floors are infested with crocodiles. The best kind of sinkhole is one with groundwater still flowing through it to keep from stagnating, where the ground surface isn't at risk of further collapse, where no infrastructure has fallen into the sinkhole floor, and where there is no entrance fee to take a quick and refreshing swim. Only trouble with these types of sinkholes is that it can be quite a journey to get to one.